Brendan shares his current wishlist and recent Kickstarter interests. Join us to drool over games that are coming! What’s on your Wishlist? Which games are you jumping out of your pants to buy? 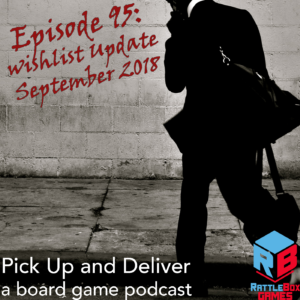 Hop over to Boardgame Geek guild #3269 to let us know. ← Pick Up and Deliver 094: Solo Game Extravaganza!